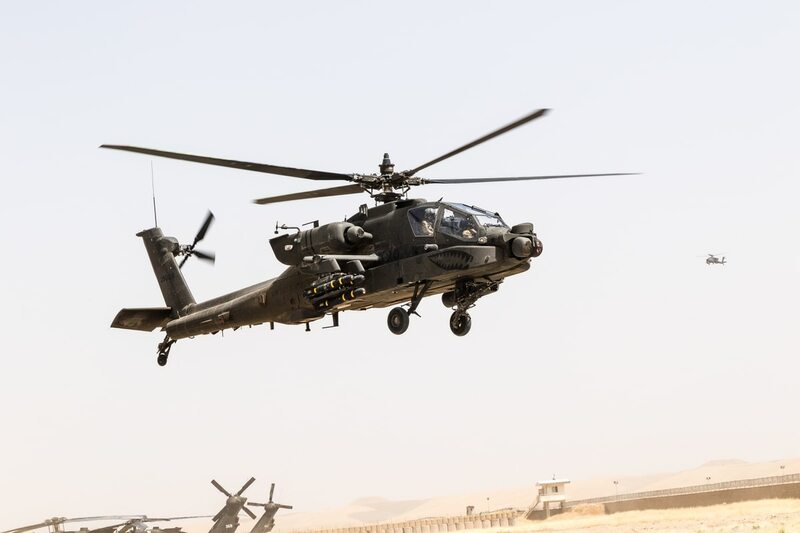 WASHINGTON — The U.S. State Department announced Tuesday it has cleared the potential sale of 10 AH-64E Apache helicopters for Egypt, with an estimated price tag of $1 billion. The Defense Security Cooperation Agency also announced it cleared $201 million in tank ammunition for Egypt and a package of Advanced Medium Range Air-to-Air Missiles (AMRAAM) for Qatar, with an estimated price tag of $215 million. The combined $1.416 billion in sales are not guaranteed; as with all DSCA announcements, the sales must pass through the Senate, at which negotiations can begin. Total quantities and dollar totals often change from the original DSCA announcement and final sale. The U.S. remains dominant in the global arms market. The headliner of Tuesday’s announcements is the $1 billion estimate for the Apache buy. In addition to the 10 helicopters, the package includes 24 1700-GE-701D engines, night vision sensors, 135 Hellfire missiles, M230 30mm automatic guns and other equipment. Boeing, Lockheed Martin, General Electric and Raytheon are the major contractors. Egypt has attempted to upgrade its helicopter fleet for some time, but lost ground in 2013 when the Obama administration froze military aid following a military coup. That aid, including weapon deliveries, resumed in late 2014. Also announced Tuesday was the potential sale of 46,000 M831A1 and M865 rounds as well as 10,000 APFSDS-T rounds, used by Egypt’s fleet of tanks, for an estimated cost of $201 million. In September, Egypt was cleared for $99 million worth of similar ammunition. Work primarily will be done by General Dynamics. Qatar, meanwhile, was cleared to buy $215 million worth of air-to-air weapons, with Raytheon as the prime contractor. That package includes 40 AIM 120C-7 AMRAAM missiles, one spare each of the AIM 120C-7 AMRAAM guidance section and AIM-120C-7 control section, eight AMRAAM Captive Air Training Missile (CATM-120C), as well as associated software, cryptology and communication security, and navigation equipment.